Oracle 12c introduced adaptive SQL execution plans, this post by Maria Colgan introduced the concept in blog post: "The goal of adaptive plans is to avoid catastrophic behavior of bad plans on the first execution. If we detect during execution that the optimizer’s cardinality estimates were wrong, then some plan choices can be changed “on the fly” to better options. While we can’t completely change the plan during execution, there are certain local decisions that can be changed, like join method." However, in this post, I will to look at how you detect whether a plan has adapted. I am going to look at a real-life example of a particular statement that I had to investigate. Plan adaption may or may not be a problem. In this case I think it wasn't, but I do think you need to know it is happening. There are some new columns on v$active_session_history and DBA_HIST_ACTIVE_SESS_HISTORY. Different adaptive sub-plans for the same overall plan will have different SQL_PLAN_HASH_VALUEs, but will share the same SQL_FULL_PLAN_HASH_VALUE. The next query shows that a particular SQL_ID has two values of SQL_PLAN_HASH_VALUES. The column SQL_ADAPTIVE_PLAN_RESOLVED indicates that not only is this an adaptive plan, but both sub-plans have been used. Note that you must pass the SQL_PLAN_HASH_VALUE to DBMS_XPLAN. If you pass SQL_FULL_PLAN_HASH_VALUE you will not find the plan. I will now extract the execution plans from AWR with DBMS_XPLAN. I am using DISPLAY rather DISPLAY_AWR because I have imported the AWR from another database, and created a view of the plan data called ASH_PLAN_TABLE). Note that this plan only has line IDs 0 to 7. If I used +ADAPTIVE option. DBMS_XPLAN will emit all the lines in the full plan, and mark those inactive in this adaptive plan with a minus in the ID column. The statistics collector operation at line 6 shows where the optimizer collected statistics at run time. And now I will produce the plan for the other hash value. The lines in the execution plan are the same, and the costs are the same, but the minus signs are now in different places indicating different lines are inactive. The plan has flipped between indexed lookups in a nested loop joins and hash joined full scans. So now I want to look at how much DB time has been spent where in which plan. The following query profiles the DB time by plan and line within the plan. We can see that the plan with hash value 3412983073 spent time in line 12, but we saw earlier that the plan only has 7 lines if it was not generated with the +ADAPTIVE option. NB: The line numbers reported in the ASH data correspond to the full adaptive plan, so be careful to compare profiles by line back to expanded +ADAPTIVE execution plans. The next query profiles database time by plan for this SQL statement. We can see that the adaptive plan of this statement is flipping backwards and forwards over several days. Then we would have to dig down further to work out why this might be happening. This is the statement. It is a vanilla query from a packaged system. The changing values of the bind variables supplied to the SQL statement have a part to play in causing the plan to change, and in this case it is not a problem and the optimizer is functioning as designed. DBMS_LOCK: How to ensure only one instance of a PL/SQL procedure can execute concurrently. I recently had a need to ensure that only one instance of a PL/SQL procedure was running concurrently. My solution was to create a named lock with Oracle-supplied DBMS_LOCK package. There are lots of other blogs and posts on the internet on this subject, but this is how I used it. Just as a row level lock will block another session from obtaining a lock on the same row, a session holding a named lock created with DBMS_LOCK can prevent another session obtaining a lock with the same name. (updated 21.11.2016) An essential difference is that by default these locks will survive a commit or rollback. Although you can choose to release them on commit. In my package MY_PACKAGE, I have a procedure MY_PROCEDURE. I want to ensure that only a single instance of MY_PROCEDURE can run at any one time in my database. A package global constant is set to $$PLSQL_UNIT$$. This evaluates to the name of the package, in this case, MY_PACKAGE. I often use this during instrumentation to pass the name of the package to DBMS_APPLICATION_INFO. In this case, it will be used as the name of the lock. I also have a package global variable L_LOCKHANDLE which will be used as the handle of the lock. The contents of this variable will be available to subsequent instances of the package in the same session. A unique lock identifier is allocated with DBMS_LOCK.ALLOCATE_UNIQUE. The lock is available for the life of the session, up to a default timeout of 10 days. The name of the lock is the name of the package taken ultimately from $$PLSQL_UNIT$$. The lock is acquired with the DBMS_LOCK.REQUEST function. It is possible to pass a timeout in section to this function for which it will wait if it cannot acquire the lock. The lock is requested in exclusive mode. Other lock modes are available, but I only want one session to be able to acquire this lock. If the request function returns a non-zero code then the lock has not been acquired and the package raises an exception with a custom message. If the package failed with an error it would continue to hold the lock in the session. Restarting the procedure in the same session would generate an error because the session could not acquire the lock again. I put the code to release the lock in a separate procedure. The lock handle is stored in a package global variable so the handle will be available from previous executions of the package in the same session. The first and last thing MY_PROCEDURE does is to call the unlock procedure. I also found it useful to be able to call the unlock procedure during debugging, so I exposed it in the package header. DBMS_LOCK is a simple and robust mechanism that can easily be incorporated into a package. Even if you can control execution concurrency via whatever you use to schedule the package, it is a useful safety mechanism. I have a number of tables on a reporting system which have referential integrity constraints, and whose contents are replicated from a primary system. I am going to create materialized views on these prebuilt tables to manage incremental refresh. However, the referential integrity means that some materialized view will have to be refreshed before others which refer to them. The referential constraints can be queried from the DBA_/USER_CONSTRAINTS view. Clearly this defines a hierarchy of tables. I could construct a hierarchical query on this data I could determine the order in which to refresh the materialized views. Naturally, I looked for someone who had done this already and I found this on the Ask Tom website: All Parent - Child tables in the database. It was written in 2001 for Oracle 8.1.6. I have used the same demonstration, and enhanced it some newer features. I ran my tests on 12c. I have no problem refreshing a materialized view C0 without an referential constraints, but C4 has a constraint that refers to C2 that has not been refreshed so I get a parent key not found error. I will start with the easier problem of incremental refresh. Related materialized views can be passed as a list to the DBMS_MVIEW.REFRESH procedure and will be refreshed in a single database transaction. Hierarchies of related tables are created by the aggregation of these constraints. I can calculate which materialized views to group together. Let's start by creating a working storage table that contains a row for each materialized view. Ideally, I would like to be able to refresh each one independently. If I were using refresh groups, each materialized view would be in its own group, which for simplicity will named the same as the materialized view. This PL/SQL block works through each referential constraint that links any two materialized views, and determines the current refresh group for each materialized view and if they are not in the same group it moves all materialized views in the group of referring materialized view to the group of the referred to materialized view. You can see that C1, C2, C3 and C4 are now all in group C3. So they need to be refreshed in a single operation. I can use the LISTAGG() analytic function to simply generate the list and pass it to DBMS_MVIEW.REFRESH. And you can see they materialized views refresh without error. If I wanted to schedule the refresh I could also create corresponding refresh groups with DBMS_REFRESH. The second question is how to fully refresh the materialized views. I will have to do this at least once when I instantiate the replication. I have a real-world case where there is a large volume of data in these tables, so I also want to use non-atomic refresh to reduce the time taken to refresh, and the size of the final table (see also Complete Refresh of Materialized Views: Atomic, Non-Atomic and Out-of-Place). I cannot use the same list approach as above. I can disable constraints to facilitate the refresh, but I won't be able to re-enable them until the data is integral. Of course I could disable all the constraints, refresh all the materialized views and then re-enable all the constraints. So in this case I need to refresh the materialized views on which C4 depends first, and so on. I need to tree walk the hierarchy of foreign keys to determine which tables need to be refreshed first. I need to start with the tables with the lowest maximum level first. Any materialized view not picked up in the tree walk is given level 0, and now I can calculate the refresh order in a single SQL statement and execute the refreshes in a single PL/SQL block. Constraints and disabled before the refresh and re-enabled afterwards. The maximum tree level of the materialized view is shown in brackets. DBMS_APPLICATION_INFO is probably one of the most undervalued and without any doubt the most underused of all the packages supplied with the database by Oracle. On the face it, it is a very simple package that does a few very simple things, but it is not possible to overstate its significance. MODULE and ACTION are just character strings. You can put anything you like in there, but I recommend that the values are meaningful to your application, consistent and predicable. And you can also identify SQL for that module in v$sqlarea. This hasn't changed since 1997 (except the strings have got longer). Today, there are a few more dynamic performance views where module and action are recorded. When we did performance tuning back in the 1990s, all we had was the buffer cache hit ratio (joke) and SQL trace (an even older feature – introduced in Oracle 6, augmented by the wait interface in 7.0.12). When you registered a session with DBMS_APPLICAITON_INFO, it was recorded in the trace. So you knew which part of the trace refers to which value of module and action. This following is taken from a 12c trace. You can see where I called DBMS_APPLICATION_INFO to set the module and action. There is also a function in DBMS_APPLICATION_INFO to set a client identifier. Again it is just a string. The idea is that you can associate an operator with a database session. For example, PeopleSoft makes practical use of this to get a user ID set by the application into database triggers that perform application auditing. It uses another procedure to read the client identifier. Although, I find it is often more interesting to know where in an application a SQL came from, than which operator activated the code. When I first looked at this feature back in the late 1990s, I struggled to see the value of MODULE and ACTION, but by then I was working with PeopleSoft, a packaged application that is still with us, and back then it did not register with the database. I used triggers to enable trace for specific processes, and then I would profile the whole trace file. Two new things in Oracle 10g made DBMS_APPLICATION_INFO very much more interesting that it had seemed to be. From Oracle 10g, it became possible to specify values of MODULE and/or ACTION for which the database would automatically enable SQL Trace. It was like setting a watch point in a debugger. Trace would be disabled when the module/action changed to something else. So, if your application set module and action to meaningful, predictable values, you now had an easy way of enabling SQL trace (See also Enabling Oracle Extended SQL Trace by Module and Action). This is why I generally avoid putting the values of variables into module or action because it makes it difficult to enable trace by this method, unless perhaps the variable has relatively few known values. ASH was introduced in 10g. It is only available on Enterprise Edition and it requires the Diagnostics Pack licence. Every second, the database records the status of active database sessions in a buffer in memory. Every 10th sample is persisted to a table in the Automatic Workload Repository (AWR). Module and Action are collected as a part of that. Hence, you can analyse the ASH data with SQL Query. 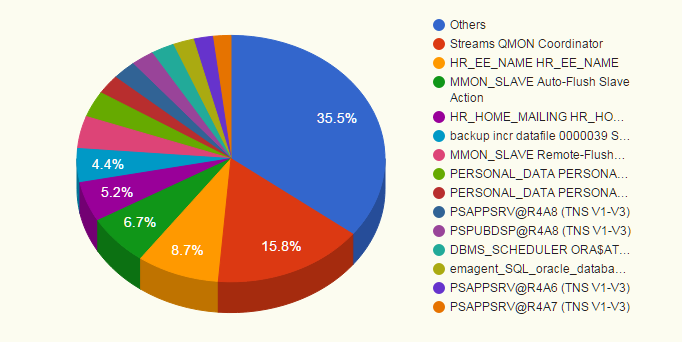 This query profiles the amount of database time by program, module and action. We can see which modules and actions taken the most database time. Then we could look for specific SQL statements associated with a particular module. AWR reports: The profile of SQL statements reports the module. Resource Manager: policies can be specified for a module and/or action. Which could be interesting, but I haven't played with it personally. I store the current values of module and action at the start of each procedure in local variables. I set the action to the name of the procedure. I may set other values during the procedure. The original values are reinstated at every exit point from the procedure. I have a constant with the name of the procedure. I use this to set the value of module. I would characterise this as an investment rather than an overhead during development, in the same way debug code is an investment that will pay dividends later if you are debugging a functional problem. The overhead of the DBMS_APPLICATION_INFO calls is trivially small, and they present the opportunity to make performance improvement activities much more effective for both developers and DBAs. What did Instrumentation ever do for us? 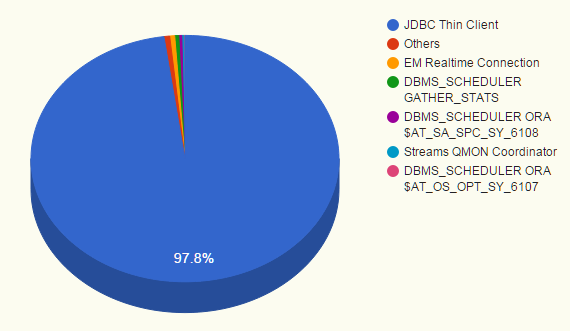 This chart is taken from EDB360 for yet another Java system that does not have any Instrumentation. Module defaults to the program name. A profile of DB time by module is not particularly useful when nearly everything has the same module. For contrast, this example is taken from a PeopleSoft system. PeopleSoft is now instrumented out-of-the-box. With instrumentation, you can see that the time is broken down between the various components of the system. Now you can see which components consume the most time and justify the most attention. Many of the module names are meaningful to the developers. Unfortunately very few developers or package vendors do this. This includes Oracle, although they have instrumented their E-Business Suite and PeopleSoft ERP packages, many others are not. Nothing in this story is new. I write and talk about it instrumentation because I think it is impossible to overstate the value of instrumentation to an application using DBMS_APPLICATION_INFO and yet it is very rare to find instrumented systems. I would characterise instrumentation, along with debug code, as a small investment during development that could pay big dividends later, rather than an overhead. Just as effective debug code can help you debug a functional problem, effective instrumentation can help you analyze performance issues. The overhead of the DBMS_APPLICATION_INFO calls is trivially small, and they make performance improvement activities much easier for both developers and DBAs. So really, it doesn't cost you anything, it will save you effort and resource later. Recently, and more than once, I have found myself explaining exactly how an Oracle database performs a complete refresh of a materialized view, and what are the implications. So I thought I would set it out in a blog post. I am only looking at the case where it is not possible to incrementally refresh using on a materialized view log because the materialized view joins tables together, groups data, or breaches one of the other restrictions (see General Restrictions on Fast Refresh). Materialized views are managed by the delivered DBMS_MVIEW package. The REFRESH procedure can refresh one or more materialized views. I want to discuss at the effect of the ATOMIC_REFRESH parameter. This parameter has been present since at least Oracle 8i when materialized views were called snapshots, so none of this is new. "If this parameter is set to true, then the list of materialized views is refreshed in a single transaction. All of the refreshed materialized views are updated to a single point in time. If the refresh fails for any of the materialized views, none of the materialized views are updated. If this parameter is set to false, then each of the materialized views is refreshed non-atomically in separate transactions. As part of complete refresh, if truncate is used (non-atomic refresh), unique index rebuild is executed. INDEX REBUILD automatically computes statistics. Thus, statistics are updated for truncated tables." It is possible to see the behaviour of the refresh procedure by using SQL trace. My tests were run on a 12c database. I have cut a lot out of the traces to make them easier to read. All constraints are deferred to the end of the transaction which is not until all the specified materialized views are refreshed. Then the complete content is reinserted. If more than one materialised view is refreshed in a refresh group, or by specifying them in a single execution of refresh, they are refreshed in a single transaction. Again, all constraints are deferred to the end of the transaction, which this time is only as far as the truncate statement. An exclusive lock is obtained on the materialized view to ensure that there are no in-flight transactions on it. The materialized view is repopulated, but in direct path mode because the APPEND hint is specified. Stats are automatically collected on a 12c database (note this statement is one level deeper). While there are lots of advantages to non-atomic refresh, but perhaps the most significant disadvantage for developers is that the data disappears during refresh. I think it is this that leads to widespread use of atomic refresh, but in the next section I show how this can be overcome. Space occupied by deleted rows not available to be reused until the delete is committed, which is not until after the insert. High water marks reset by truncate. All space in table released immediately. Table likely to be about half size of atomically refreshed materialized view. Significant undo (and therefore also redo on undo) overhead. Minimal undo overhead. Delete and Insert performed row-by-row. Indexes are maintained during DML. Insert performed in direct path mode. Faster. Indexes rebuilt when insert committed. Table can be compressed by explicitly rebuilding after refresh, or requires Advanced Compression Licence. Table data can be compressed using basic compression without needing Advanced Compression Licence. This would also work well with Hybrid Columnar Compression (HCC) on Exadata. Statistics are not collected. It may be necessary to collect them manually. In 12c, table statistics will automatically be updated. Content of materialized view always available due to read consistency. Materialized view will appear to be empty while refresh process is running. Refresh of multiple materialized views can occur in a single transaction so that they remain consistent. Each materialized view refreshed independently. In this section I want to explain how to evade the problem of the data disappearing from the materialized view during non-atomic refresh. Like all the best conjuring tricks, you require two materialized views! First, I will describe a workaround for use with Oracle 11g or earlier, then I will look at a new feature in Oracle 12c. I want to create a simple stand-alone demonstration. I need a materialized view that will take several seconds to refresh so I can check whether the data is still available during that process. So, I need a long running query, for which I am using Jonathan Lewis's kill_cpu script. On my database, it runs for around 10 seconds. I am going to create two identical materialized views based on (almost) the same query. It then recreates a view on the freshly refreshed materialized view. The application should reference this view, and so it will always point to the most up-to-date materialized view. The view will refer to the older materialized until the refresh is complete so the data will never disappear. Complex view merging means that any query will seamlessly reference the underlying table and the performance will be as if the application had referred to the materialized view. In-flight queries will not be affected by the view being rebuilt. They will continue to run against the now older materialized view. The first time I ran the script MY_EXAMPLE1 was refreshed and the view was rebuilt to point to it. The next time I ran the script MY_EXAMPLE2 was refreshed and the view was again rebuilt. There is a trade-off to this approach, but I suggest that the advantages of this approach to using non-atomic refresh outweigh the additional complexities. Data is always available during materialized view refresh. The refresh and view rebuild process is more complex, though it could be encapsulated into a PL/SQL procedure. Each materialized view will be half the size of the atomically refresh materialized view because space is freed by the delete is only available after the commit. So the overall space requirement is about the same as atomic refresh. Two copies of the materialized view and its indexes are required. Refresh will be faster because indexes are not maintained during the insert, but are rebuilt afterwards. Queries no longer run on view being refreshed, so database does not have to do consistent reads of data blocks. This should prevent query performance being degraded during refresh. Basic table compression (or HCC on Exadata) could make it considerably smaller. This should also improve query performance by reducing I/O. I have not reserved any free space in the table in my demonstration because I know the table will never be updated. Further saving space and reducing I/O. Out-of-place refresh is a new option on DBMS_MVIEW.REFRESH in Oracle 12c. The complete refresh process builds a new table which seamlessly becomes the materialized view, the old table is dropped. It only works in conjunction with non-atomic refresh. It also works with incremental (or fast) refresh. As with my 11g workaround described above, two copies of the data are used. The refresh process creates and populates a new table with indexes, exchanges the new with the old, and drops the old table. For this example, I have enabled the recycle bin so we can see the dropped table. Each time I refresh the materialized view, the table gets a new object ID, and a new object appears in the recycle bin. The object ID of the new entry is the previous object ID of the materialized view. A new table was created and the old table was dropped. The intermediate table name is RV$ followed by the object ID in hexadecimal. A trace of the refresh process shows the data being inserted into another table. However, note that it is a conventional insert, not a direct-path insert. So statistics will not be collected automatically. The DDL statements at create and drop interim tables are truncated in the trace, but can be reinstated with event 10979, level 1 (see Jonathan Lewis's 12c MView refresh blog). This event also causes additional progress information about the refresh process to be written to the trace file. Out-of-Place refresh has some advantages and disadvantages over my 11g method. The entire refresh process is encapsulated within the DBMS_MVIEW.REFRESH procedure. Physical tablespace is still required to hold two copies of the table, but now only during the refresh. The original table is dropped after the new one is built. If the recycle bin is enabled, every out-of-place refresh will preserve another copy of the table and any indexes. I recommend disabling the recycle bin. The data is always available while the materialized view is being refreshed. Long running queries running across the out-of-place refresh will continue to run correctly, at least until the data blocks used to hold the dropped table are overwritten, when an "ORA_08103: object no longer exists" error will be raised (again, see Jonathan Lewis's 12c MView refresh blog). The table is populated in conventional rather than direct path mode. Although the indexes are built after population. This has a number of consequences. The performance of the conventional insert will not be as good as direct-path insert. Simple table compression will not have any effect. HCC is probably not an option. Table statistics are not automatically collected by On-Line Statistics Gathering, but the indexes will have statistics computed as they are rebuilt during each refresh.